The church taught we were all born sinners, with “original sin.” Then, when you reached “the age of reason,” you had to take full responsibility for all future sins. If you committed any sin, big or small (“mortal” or “venial” in the church’s terminology), you were no longer living in a state of grace. The only way you could return to that state of grace was to confess your sins to a priest in the confessional. I no longer accept any of that for myself. I know others do, including many in my family. I respect and honor their values and beliefs. After all, it works for them. You were all born in a state of grace. You have never left that state of grace, no matter what “sins” you think you’ve committed. You are children of God. You are God. You are the universe. You are, as you say, “pure as the driven snow.” See yourselves that way, as we see you. Then your entire life, your entire being, will shift into a higher vibration. You will see yourselves through our eyes—wise, powerful loving beings of light and love. You are always in a state of grace. You have never left that state of grace. Remember that, always. What do you think about original sin, and the whole concept of sin? Do we need the intercession of a priest or other minister to return to a state of grace? Amazing Grace has been one of my favorite songs since childhood. I only recently came across this beautiful instrumental version by panflute musician David Döring, filmed in the beautiful Austrian Alps. Lesson 169 in A Course in Miracles says “By grace I live. By grace I am released.” I am including Jimmy Twyman’s youtube video for this lesson. It’s very much in alignment with Mikala’s comment. This is a small true story about Grace. I was just getting out of my car at the market when I saw this quite elderly lady looking very distraught, frightened, and just lost. She was looking around everywhere and becoming more stressed each moment. I walked to her and asked with a grin, “Loose your car? I do that all the time.” She quieted some, but was still very upset. I said, “Maybe I can help. What kind of car do you drive?” She said, “I don’t know?” So, I asked for the color, which she said was not really white, but kind of creamy. Then I asked some questions about the size of the car. She said it was between a “regular car” and an SUV. By this time she was settled and focusing on what her car was like. I saw, not at all far from us, a creamy white small Subaru – one of the smaller models. I pointed it out to her and she recognized it as hers. She then asked me how I found it so fast, to know her car and see it so quickly. First I told her that I’d been there before myself, and secondly, very clearly I heard, “Tell her that when you just stand quietly, the car will find you.” She smiled, got in her car and drove away. I deeply understood what Spirit was telling both of us. What a beautiful story! Thank you, Micki. Curiously, I woke up this morning with the words from a hymn I used to love as a child ‘O Lord have mercy with loving kindness. Have mercy on me and purify my heart’. 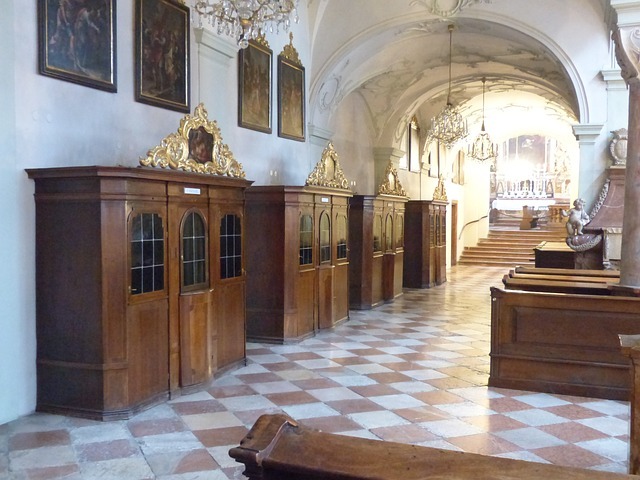 It was the confessional that actually loosened the hold my Catholic upbringing had on me. I felt I should be saying sorry to the people I had offended. However, years on doing much needed releasing of negative patterns of thought, I have found a deep rooted one which stems possibly from those early influences. It’s a martyrdom complex! The need to suffer to validate yourself. It has been very liberating to free myself from this and it seemed appropriate to share it today in response to this. I often find I get the message you send before I actually open your emsil and find that only demonstrates our oneness. Thanks very much, Margaret, for sharing your Catholic experiences. I agree with your comments on the “martyrdom complex” — we were totally brainwashed with that one! Like you, I’ve liberated myself from that nonsense. Unfortunately, there are still a few in my generation of our family who still carry that heavy burden. Not surprisingly, they’re all women. Yes, indeed, we are all one — and fully connected on all levels. I sing Amazing Grace to myself every day. My children gave me a framed copy of all five verses which are hanging in the hallway to my bedroom. Thanks, George. It is indeed a beautiful song. Amazing Grace how wonderful David played it! Beautiful! John, I love your article and readings, spending time in a hotel room provides me lots of time to read, reflect, continue to be joyful, and at peace…even as I take each day as an inner promise to myself, I am getting closer to being with my cats and in my home in the near future! God’ Divine will will guide me through this experience. Thanks so much, Karen. Yes, he does indeed play it so beautifully! I’m delighted you have found some positives in the challenging experiences you’ve been through lately. Most of us will never know what that’s like. Indeed, God is guiding you through this time of your life. Wow, what a question, or questions, John. Original Sin. Hmm. Look at a new born baby. There is no way one can see “sin” in this little one. They are miracles of Light. Once again I return to the concept of Free Will, given us by the Creator. If one is given Free Will to explore all there is on Earth as a way of learning what feels right to you within and what does not, how can either be “sin?” One does not always make perfect choices in their life, but isn’t that the point? Those choices that feel good, make your reality joyful and blissful, are the state of Grace. We must each find that for ourselves. Spirit and our soul support us and nudge often, but the choice is up to us. Either way, Grace is our foundation. I believe we live in a state of Grace at all times. When we accept that, acknowledge that, understand that, life is so amazing. Grace comes to us as unconditional, powerful love. It brings us peace. It does not come from other human beings here on Earth. We were created to follow our own path, surrounded by Grace at all times. I acknowledge that this is my personal belief. I agree with the beautiful expressions written by Mikala on Grace being all around us. provided free will, if we choose to follow God’s Divine will by choice Our state of Grace is in full awareness, yet God surrounds us all in Grace 24/7 yet consciously….awareness levels may differ, due to the choices one makes, does the Ego lead you down the path,or does your true IAm God source lead you? Grace is surrounding both choices yet the vibrational frequency is higher when we choose to embrace the I AM divine free will essence of light, love, and hope. Thank you again, Karen. I’ll let Mikala reply to you. You asked: .awareness levels may differ, due to the choices one makes, does the Ego lead you down the path,or does your true IAm God source lead you? The answer to that is “Yes.” Here again is a choice. Grounding yourself in Grace is to let go of everything else. Rid yourself of tension, busy thoughts, “musts” and “shoulds” and “have to(s).” Sit with and absorb the Grace. Each breath you take comes from Grace. The oxygen within that breath comes to us from Grace. All that we are and our existence comes from Love/Grace. We can’t make it go away. To live completely in Grace as a choice, you need to let go of everything else. That includes the need for control over everything or anything. That is letting go of the ego need for control. Grace comes to us, there is no need to strive, try harder, be better, learn more, work more. Sit with Grace and all you need comes to you softly. If you just have to control your life, your brain and ego are leading you down the path. If you can sit in the peace of Grace and let go of all else, your I AM presence (the wholeness of your Divine Self) is leading. If this is an interest you have and wish to explore “Grace,” I would suggest MirandaMacpherson.com . This lovely lady has studied years in this arena. Blessings to you. I hope I have responded clearly. Beautifully stated…Grace is ever present…. In the eyes of God, there is no such thing as sin. If we make a mistake, we are automatically forgiven. We need no intercessor. We are always in a state of grace. Thank you, Linda. As you say, in the eyes of God there is no sin. We are indeed always in a state of grace.